You can configure your Practice Timezone and Facility Working hours by following the steps given below. 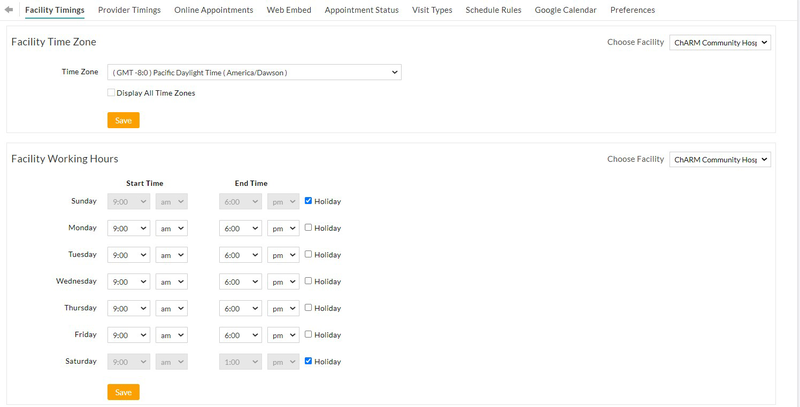 This is mandatory to ensure that your appointment scheduling screen shows the appropriate working hours for your practice. Choose your timezone in the "Practice Timezone" section, and click on "Save"
Configure your practice timings and holidays in the "Facility Working Hours" section, and click on "Save"
Repeat the above process for each of your facility, if you have multiple facilities configured.